Ned began his sermon speaking about the process of waiting and how it intensifies as the waiting progresses. Also of the sense of anticlimax that we often experience when the waiting is over. He spoke of the faithful persistence in prayer exhibited by Simeon and Anna, how they spoke of the things to come, their expectations for the one who they held but would never see grow to fulfill their visions. But what about when prayer is not answered? Ned suggested that the story is not so much about the faithfulness of Simeon or Anna but its all about the silent One around whom all the action takes place: the infant Jesus. He spoke very movingly of his own struggles in prayer over his wife’s health and how She displays such faith in God, and thankfulness for the good she enjoys as a gift from God. God is with them in the midst of the good and the not so good and it is God’s presence that makes the difference and transforms everything. 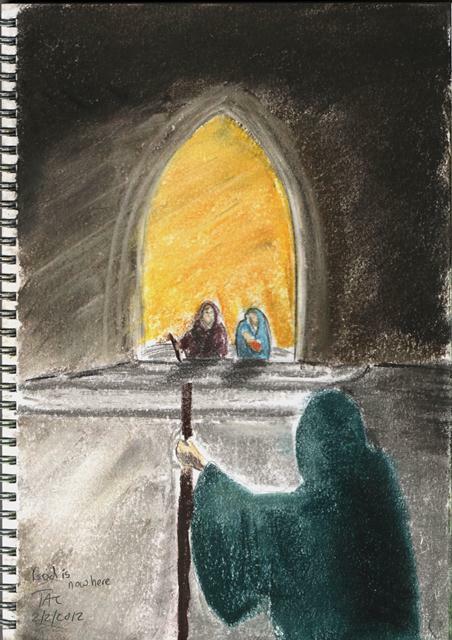 The image attempts to capture the sense of expectation, the longing, the waiting, and that moment when Mary and Joseph entered the temple with Jesus; the eyes of Simeon watching and waiting. Is this the one? The one who would herald such great changes? I hope it also somehow shows the small and apparently insignificant bundle of humanity is the still point of the action, the cosmic singularity at the center of all time and space; God is with us, God is now here.